ERBIL, Kurdistan Region – Resuming the export of Kirkuk’s oil to the Turkish port of Ceyhan via the Kurdistan Region’s pipeline is a “positive gesture” that will help resolve the constitutional dispute between Erbil and Baghdad, KRG Prime Minister Nechirvan Barzani said Monday. “Now that a new government is in place in Baghdad, we hope we will be able to resolve all the issues between Baghdad and Erbil and together step forward for a brighter future for Iraq,” Barzani told an event in Erbil marking 10 years since Emirati firm Dana Gas began work in the Region. 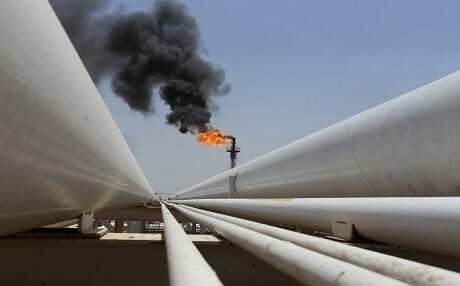 “The latest agreement between the KRG and the Iraqi government for the resumption of the exportation of Kirkuk oil through the Kurdistan Region’s pipeline to the Ceyhan Port is a positive gesture, which will benefit the public revenues of Iraq and play a partial role in resolving some of the financial issues recently gripping Iraq,” the KRG prime minister said. Iraq desperately needs to boost its revenues to cope with the crippling cost of reconstructing its cities shattered by years of civil war, to relocate millions of internally displaced people (IDPs), and to revamp its dilapidated infrastructure. As OPEC’s second biggest oil producer after Saudi Arabia, the sale of Iraq’s natural resources will be vital to its recovery. However, the Kurdistan Regional Government (KRG) and Iraq’s federal government have long disputed the export, revenues, and control of Iraq’s oil and gas resources – fueling a constitutional crisis and calls for Kurdish independence. When the Region held its referendum to break away from Iraq in September 2017, Baghdad responded by seizing several of the territories disputed between Iraq and the Region militarily, including Kirkuk’s oil fields. The KRG had been exporting Kirkuk’s oil independently via the Ceyhan pipeline. After seizing control of Kirkuk, Baghdad began trucking the oil over the Iranian border – bypassing the Kurdistan Region. However, when the US imposed sanctions on Iran, Baghdad was forced to negotiate a deal with the KRG to resume Kirkuk oil exports via the Region’s pipeline. The agreement is seen as a positive step toward normalizing Erbil-Baghdad relations. “In addition to our support to the government of dear [Iraqi Prime Minister] Adil Abdul-Mahdi, the KRG is ready to resolve and decide on every single problem in accordance with the constitutional mechanisms and embark on a serious process of talks and work together to implement all the constitutional rights that are entitled to all of us from the constitution,” said Barzani. Barzani used Monday’s event in the Kurdistan regional capital to invite global firms to follow the example of Dana Gas and Crescent Petroleum to invest in the Region’s oil and gas fields. “The private sector is playing a massive and significant role in the development of Kurdistan,” he said. He also hailed improvements in power generation in the Region, with the ultimate goal of providing citizens with uninterrupted electricity. Iraq and the Region are blighted by daily rolling blackouts. Beyond the energy sector, the KRG also hopes to expand industry, tourism, and agriculture, he added.